Beads in embroidery create interesting bumpy texture and add 3-dimensional lift. That sounds awesome—until you start stringing a hundred tiny orbs that roll around when you try to pick them up. How many times have you toppled your bead tray, or how many beads have you lost under in the couch, while trying to embroider with them? There's an easier way! 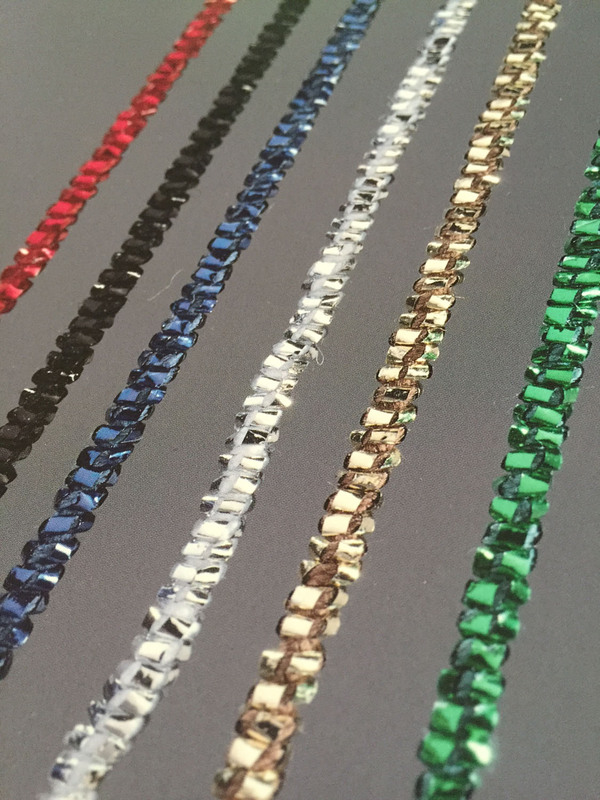 We're here to make your bead-life better, with Kreinik Facets. Kreinik Facets are a bead-like yarn that you couch on the surface of your needlework. They're essentially beads that are already strung together. So you get no mess, no flying beads—only the cool look of 3-D texture without the hassle. 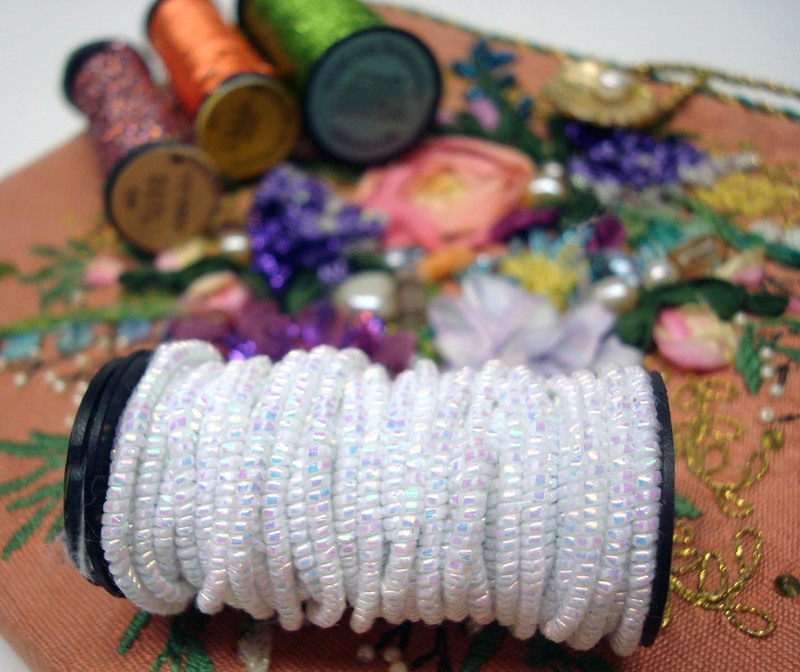 On your way to becoming a Kreinik thread expert this year, you will want to explore this fun fiber option. Here's everything you need to know about Kreinik Facets to make your next project as gorgeous as ever. It's faster than beading. Imagine simply laying one strand of beads, rather than threading individual beads one at a time. It's a surface embroidery thread, you don't stitch in and out with it like a traditional Kreinik Braid. This actually makes it versatile: you can use it on any size canvas or fabric. It comes in two sizes: regular Facets and Petite Facets, which are half the weight of regular Facets. It comes in a wired version. Aside from the obvious 3-D effects, the wire holds its shape while you couch it down (ie, great for cursive words). You can use it to make interesting cords. Take the red Facets and cord with Kreinik's Micro Ice Chenille in green, for instance, using the Custom Corder tool, then turn the cording into a wreath shape. The Facets look like holly berries. Think of this fun fiber for borders, trims, cording. Use Facets to replicate jewelry, garland, rope-like areas, or any motif where you would normally use beads. First, prepare the ends. This is the trickiest part about Facets, but easily controllable. Wrap a piece of tape tightly around the end. Use a large needle or awl to open the hole in your fabric or canvas, and plunge the end to the back of your work. 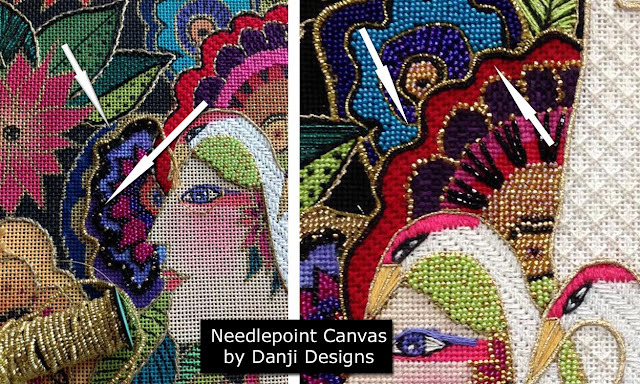 Use the needle or your finger to "close" the canvas/fabric fibers around the Facets. Alternate thread-end prep: use a clear nail polish or FrayCheck™ to stop any raveling. After it dries, the ends can be secured as part of your stitching on the surface of your work (no need to plunge to the back). Couch Facets (tack them down) using either a matching color of Kreinik thread (like #4 Braid or Cord), a clear monofilament thread, or a contrasting color of any thread (like silk or metallic). What you use to couch them depends on the look you want to achieve in your design. Feel free to experiment and have fun here. When finished, either plunge the end to the back (as in #1 above) or use #2 option to finish off the end. Find Kreinik Facets, Petite Facets, and Wired Facets in your favorite needlework store. They come on spools or skeins (the wired version). For large projects, they are available on cones by special order. Tis the season! That is, the time of year when it's too warm for winter sweaters but too cold for spring dresses. What's a girl to do when she still wants to wear her art out? 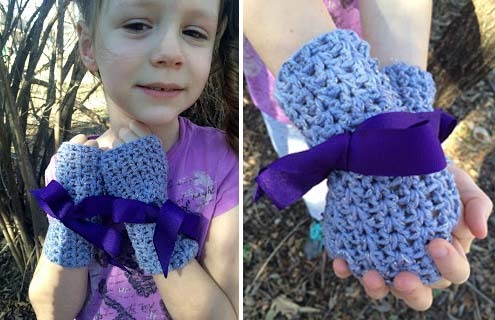 Crochet these lightweight fingerless mitts for Easter dresses, tea parties, Sunday school, or early morning waiting at school bus stops. The pattern is free! Designed by April Garwood for small sizes, the gloves feature Kreinik's soft Ombre metallic yarn. This thread is so soft you won't even notice it by feel. But the variegated color adds light and shine for eye-catching prettiness. It's the perfect add-in fiber for any project needing a special touch. April chose Kreinik's Misty Violet color, which features shades of silver, lilac, lavender, and purple. April has many more crochet patterns you'll love. 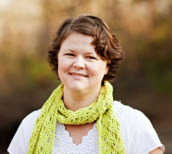 Look for her on Ravelry, Etsy, Facebook, the Banana Moon Studio blog, or the Kreinik website (link to her Spring Frost Crocheted Scarf is below). Her background is impressive: a degree in microbiology from the University of Oklahoma. Her "foreground" is universal: "I have yarn in my hands as often as possible." Many patterns are ideal for busy moms who want to make things that are fashionable, creatively fulfilling, and suitable for adults or children. Thank you, April, for sharing this free pattern with crocheters! If you're a stitcher, look for needlework retreats and schools in your area or where you can go on vacation. Unlike high school which may have involved homework stress and emotional turmoil, needlework school is fun. 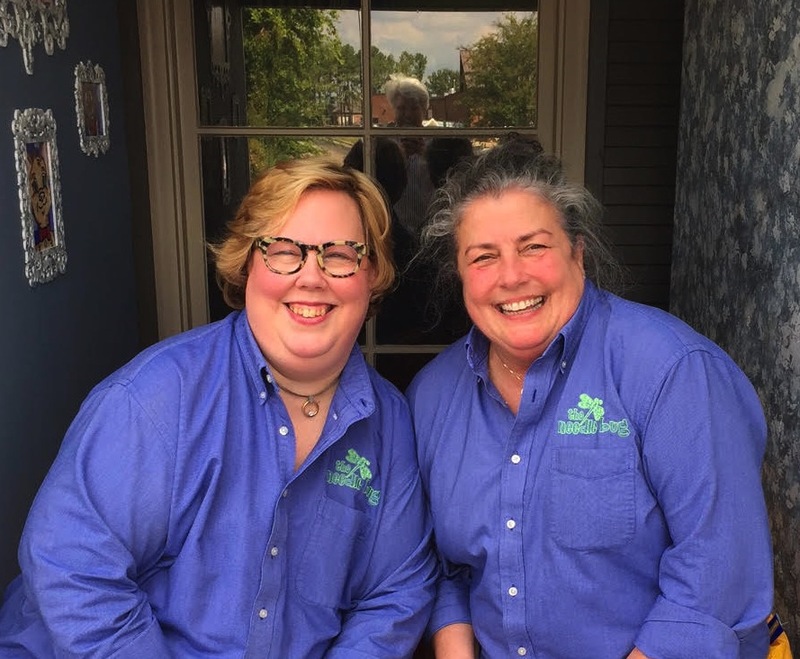 It's a chance to socialize with like-minded people—making instant friends—while expanding your stitching repertoire and making something beautiful. Hopefully you will finish your project, but the goal is to learn something and have fun. Don't hesitate to sign up for needlework school. Don't fear the teacher, don't fear the project, don't fear the homework…Just sign up and have fun. We're pretty sure you'll discover new ways to use Kreinik threads in some of these classes too. What a great way to become a Kreinik thread expert. 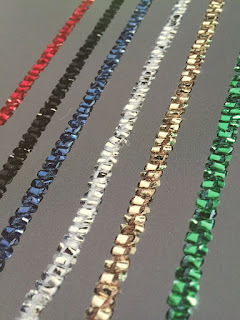 Rumors about discontinued Kreinik colors are circulating again. Sometimes a shop may be out of a color, or there could be a delay in production, and that's how rumors start. We recommend you check with us directly if you hear anything about Kreinik or a color. We haven't discontinued any colors since 2014. However, in light of recent enquiries, we thought it best to list those colors again. We hate to let go of any color, but sometimes it's necessary to clean up the line and make room for new colors. If you are mid-project and run out, contact us. We may have leftover stock or can help you find a shop with leftover stock. Keep this list handy. Share with your stitching friends and favorite needlework store to help clear up the rumors.